Posted by Elizabeth Paul on Saturday, February 6, 2016 in College Life, Commons, Dance, Food, Freshman Life, General Information, Living Learning Community, Student Life. On Friday night, Vanderbilt transformed the Commons Center for the party of the year– Commons Ball 2016! Commons Ball is an annual celebration complete with dancing, amazing food, photos, fun activities, and a new theme every year. Each year, the ten Commons House presidents plan and organize the event which is open not only to freshman, but to all Vanderbilt students. 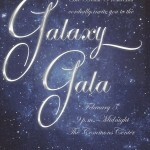 With a night under the stars, this year’s theme was Galaxy Gala, a classy and elegant spin that took the Commons Center out of this world (see what I did there?). Vanderbilt projected stars on the outside of the building and swirly lights on the inside ceilings, decorated the area with star ice sculptures, and had laser tag! I had never played laser tag before, so I was excited to try it out, and I had a lot of fun with it. My team lost, but I wasn’t the first one out, so I’ll count that as a victory. 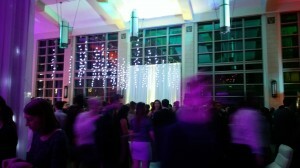 With all the tables gone, the dining center becomes the perfect party area. 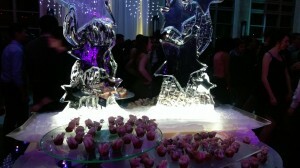 Other activities included caricatures, karaoke, and galaxy-themed crafts, and, of course, dancing. The food, though, may have been the best part. The food options included stuffed grilled eggplant, artichoke flatbread, sushi, shrimp, and various fruits, meats, cheeses, and breads. My favorite food by far, though, was the cheese fondue! There were three options for cheeses and plenty of dipping sides to choose from, including bread, apples, and pretzels. 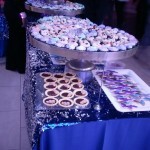 For dessert, they had blue velvet cupcakes, a galaxy cake, cotton candy, ice cream, brownies, and cookies. 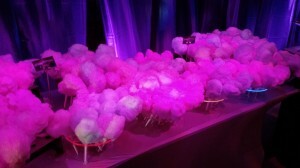 I don’t think I have ever seen a more beautiful dessert display. 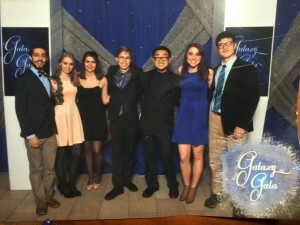 I had such a great time at the Galaxy Gala, and it is easily one of my favorite parts of my first year at Vanderbilt so far.